Am I Covered If a Fight Breaks Out In My Bar? Owning a bar has a number of unique risks not common in other industries. 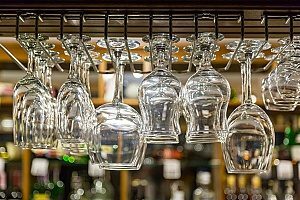 As bar owners earn a livelihood from serving alcoholic drinks, it is inevitable that an accident will occur at one point or another. From property damage to physical altercations, such incidents can result in serious legal repercussions. Having adequate insurance, whether it be liquor liability insurance or just commercial property insurance, can help protect your business from suffering the financial consequences of unforeseen incidents. Learn more about bar insurance and why you should speak with a bar insurance broker. Liability insurance is a must-have for any liquor establishment. While most customers are able to drink safely, others may suffer the aftereffects of too much alcohol consumption. When a patron drinks too much, many things can happen. The patron may lose his balance and fall, causing personal injury and property damage. A patron may also become angry and engage in a physical altercation with another patron, causing even more injuries or damage. Patrons are not the only people who require coverage. Employees too should be protected with bar insurance. Bar staff are at risk for injuries if a patron becomes aggressive. General liability insurance provides coverage for injuries, property damage, and lawsuits relating to customers who visit your bar. This type of insurance is required by most types of businesses and is generally needed to sign client contracts and commercial leases. General liability insurance protects against various common risks, such as customer injury, customer property damage, or advertising injuries like libel, slander, or copyright infringement. 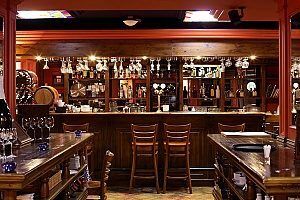 If your bar is relatively small, you may be able to bundle general liability insurance with commercial property insurance, which typically costs less than purchasing the two policies separately. 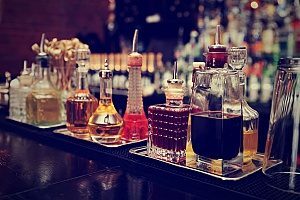 Liquor liability insurance is recommended to any business that generates a profit from alcohol, such as a bar, tavern, or restaurant. This type of insurance helps fill the gap that a general liability policy may have in its policy. Most states in the U.S. require establishments that sell alcohol to carry liquor liability coverage. You can find most liquor liability policies sold as stand-alone policies. However, they can sometimes be packaged with a general liability policy. Liquor liability insurance does not cover incidents relating to the selling of alcohol illegally, such as selling alcohol to a minor. Assault and battery coverage is a specialized form of insurance designed to cover particular incidents, such as physical conflicts between two or more patrons. If a confrontation is covered by a policy’s terms, the insurance will generally pay for any legal fees or settlements associated with the claim. While it may seem reasonable for the patrons themselves to be responsible for any injuries sustained in a fight, there are certain circumstances in which a bar owner may share responsibility, such as if a bouncer injures a patron resulting in lost wages and medical bills. If you are responsible for employing the bouncer, some of the blame may be placed on you. Workers compensation insurance acts as a safeguard for employees. With workers compensation, you can offset some of the unforeseeable risks that your employees may face in the workplace, such as personal injury. Workers’ compensation insurance helps protects businesses by providing the necessary funds to cover any lost income and medical bills that may accumulate due to the accident or injury. In addition, workers compensation may also cover the legal costs relating to the incident, such as the cost of lawsuits and settlements in the event that your employee sues you for damages. Whether you own your own building or lease, commercial property insurance is something every business needs. Commercial property insurance helps protect your company’s physical assets from storms, fire, vandalism, theft, burst pipes, and explosions. There are some things not covered by most property insurance policies, such as floods and earthquakes. Commercial property insurance covers both your building and everything in it, such as furniture, computers, equipment, inventory, and others’ property. It also covers assets that may be located outside of your business, such as exterior signs, fencing, and landscaping. If you own a bar and do not have ample insurance, you may be worried about what would happen if a fight ever broke out. Without the right type of insurance, you may find yourself paying out-of-pocket for medical bills, lost income, pain and suffering, and various legal costs and settlements. Fortunately, liquor liability insurance and similar policies are available to keep your business protected from such expenses. They can also give you peace of mind that you will not suffer the financial consequences of uncontrollable events. For more information about any of the insurance types mentioned or for help applying for bar insurance, contact a bar insurance broker today. Previous Post: « Does My Cannabis Grow Operation Need Technology Insurance?